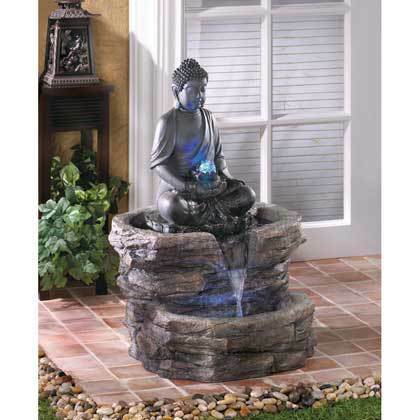 ZEN BUDDHA FOUNTAIN by Cascading Fountains home decor, jewelry, decor, decorations, electronics, fountains, floor mats, art glass, vases, garden essentials, fireplace screens. Buddha in repose is the timeless image of Zen serenity, shown here as a sophisticated centerpiece surrounded by waters gentle flow. An elegant decoration that instantly turns any garden into a tranquil retreat! Submersible water pump included. Due to the size and weight of this item, we are ONLY able to ship it within the Continental United States, to physical address locations, and only via UPS Ground. Weight 26 lbs. Submersible electric pump included. Polyresin. UL Recognized. Material(s): POLYRESIN LED LIGHT. Dimensions: 21 1/8" x 20 1/8" x 29 3/8" high.